In these all-too-interesting times, the headline I found most disturbing last week, from The Wall Street Journal, was this one: ‘Greek Troubles Cause Barely a Ripple’. This was not mere hubris but arguably something worse, since investors have aggressively been putting their money where their mouths are. A salient result, the Journal reported with no hint of alarm, is that “the bonds of other weak European countries have hardly ever been stronger.” Indeed, this is how very desperate capital has become in search of decent returns. But then, why would investors stop lending Other People’s Money to basket cases like Greece, Portugal and Spain as long as Germany, the only European country with real skin in the game, isn’t threatening to ring down the curtain? On Friday, when news crossed the tape that Greece and its creditors had agreed to kick the can down the road for four more months, Wall Street rejoiced in the way we might have expected: Stocks ratcheted up to new record highs, and a torrent of institutional money moved in the blink of an eye from Treasury Bonds into dubious euro-paper issued by the basket cases. Not that institutional traders actually believed anything of significance had happened. No, they routinely buy into this sort of non-news, and into the latest claptrap from the Fed, because they know the knee-jerk idiots at the trade desk next door – i.e., the competition — will be buying it. For its part, Germany hasn’t eased the terms of any agreement it might hope to conclude with Greece. But for the time being, the status quo has been frozen in place, and that is all that’s needed these days to send stocks into spasms of jubilation. For our part, we went short ahead of the weekend, buying put options in SPY, DIA and AAPL. We felt uncomfortable doing so, to put it mildly, since we were stepping in front of a vicious short squeeze on a Friday afternoon. But we did it anyway, impelled by the most persuasive technical set-up we’ve seen in a long while. Specifically, as Friday’s session drew to a close, the Dow Industrials, S&P futures and Apple shares simultaneously and precisely achieved important ‘Hidden Pivot’ targets that had taken months to reach. We’d been quietly reminding subscribers of these targets for weeks, and so it was time to lay down a bet, even if stocks were in howling-banshee mode. Whether this proves to be an important top or not, we’ve assumed all along that Mr. Market would never make it easy. The targets, two of which were first broached more than a month ago, are as follows: AAPL: 129.20 (actual high on Friday: 129.50); E-Mini S&P: 2105.00 (actual high: 2108.75); and DJIA: 18142 (actual high: 18144.29). An hour before the close, stocks pulled back from highs that had even more precisely matched our targets. But buyers got second wind, and when the dust settled, the targets had been exceeded slightly. 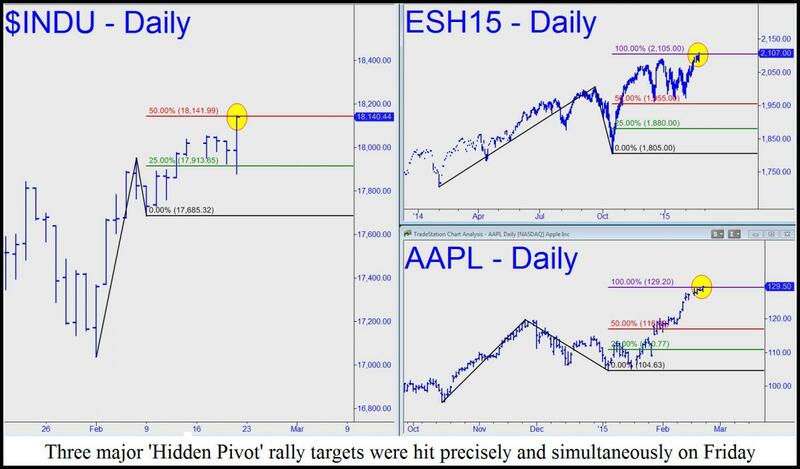 Come Monday morning, voracious buying could turn our Hidden Pivot targets into chop suey. That would not invalidate them, however; it would imply only that sufficient buying power remains to push these vehicles to Hidden Pivot targets of even greater degree. Also, the fact that the targets were very closely achieved on Friday allows us to infer equally precise targets for any next up-thrust that impends. Specifically, if Apple blows past Friday’s high, the stock should be assumed headed to exactly 144.56. And if the Dow Industrials shred their way higher on Monday, it would be telegraphing a next leg up to 18486, or 18598 if any higher. As for the E-Mini S&Ps, a moon shot to 2227.50 would likely lie in store. Those who are skeptical about technical analysis should jot down those numbers, refer to them, and even try to profit from them, if U.S. stocks should continue higher.